It’s not too late to schedule your family session with Sheila Hebert Photography. While there are still open spots through the rest of the year, the weekend times are almost gone! There are more choices available during the week, but with very limited afternoon/evening times. 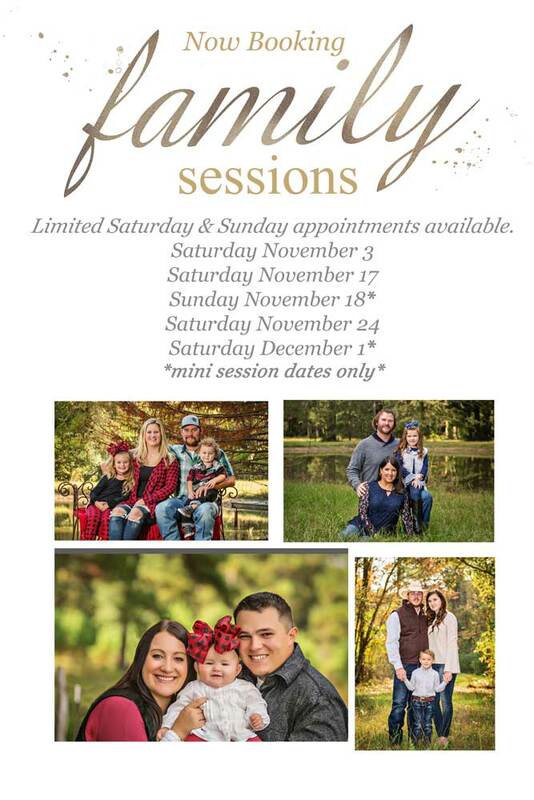 This year I’m offering two different types of family sessions: The COMPLETE session and the MINI session. You’ll get the greatest variety of images with the COMPLETE session. These sessions are for those families who haven’t had their family portraits updated in a while and want beautiful portraits to decorate their walls or want to preserve the memories in an heirloom family album. A COMPLETE session at Sheila Hebert Photography includes multiple indoor and outdoor areas and has a $70 session fee (prints/digital files purchased separately). The MINI sessions are 30-minutes and include one area (indoor or outdoor – the area/backdrop is predetermined before your session). This is the perfect session if you’re are just wanting a few images for gifts and/or Christmas cards. The session fee is only $50. If you’re not sure which session is right for you, give me a call so we can discuss the details of each.